are designed to increase the shatter resistance of glass. They are similar to regular window films in that they are polyester laminates and are often chosen for buildings where bomb blast mitigation may be necessary. The difference, however, is that these products are usually thicker they are offered in thicknesses ranging from 4 to 21 mils – and use a heavier and more aggressive adhesive system. This material is available in clear or a variety of tinted, solar energy-reflective versions to get not only the benefit of increased glass strength but to conserve energy and make the building more comfortable. Security window films are the result of a sophisticated manufacturing process in which the finest raw materials and state-of-the-art technology is used for the most effective shatter-resistant window protection. Depending on fragment retention performance and budget constraints, shatter-resistant window protection can be installed on the glass only (known as a daylight application) or physically attached to the window frame (known as attached systems). The easiest, quickest and least expensive method of window protection is to use the daylight application. The daylight application involves placing the fragment retention window films onto the vision area of the glass only. This approach will hold glass fragments together but does little to increase the blast resistance of the glazing system. If the blast pressures exceed the strength of the glass itself – somewhere between Â½ and 1 psi – the entire filmed piece of glass could be pushed into or sucked out of the room. The purpose of the fragment retention window film is to hold the glass shards together in one piece. Since the glass fails before the film, minimum thickness fragment retention films are usually specified. 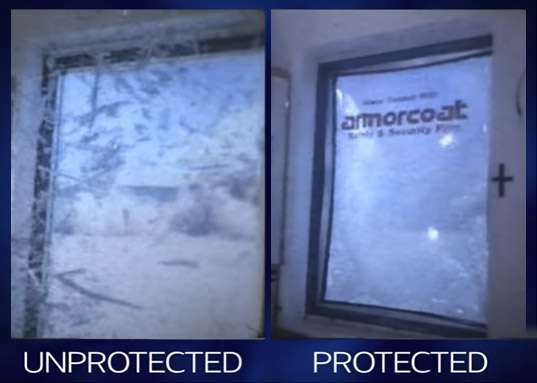 To address the requirements of some of our more vulnerable customers with advanced security needs, Commercial Window Shield developed its proprietary Blastight window film attachment systems. The attachment can be on one, two or all four sides of the frame and can be achieved with either a mechanical (metal) or chemical (structural silicone) attachment. Wet glaze systems are similar to mechanical attachments except a silicone adhesive (caulking) is used for the attachment instead of a metal batten. This method is also sometimes called a chemical attachment. The film is applied to the vision area of the glass or daylight opening. Then, a bead of high-strength, high-quality structural adhesive is placed around the perimeter of the window frame. It’s imperative that a minimum half-inch of adhesive contact the film and a half-inch of adhesive contact the window frame. This system is comparable to a four-sided mechanical. It’s easier to get a quality installation but it’s highly installer sensitive. This system may be the only choice for certain window frame types. It also may be ideally suited to historical buildings – especially windows with multiple small panes where a mechanical attachment can’t be used or won’t fit. It’s imperative the proper thickness and overlap of structural silicone be used. Heavier gauge films are generally used with this system. Here’s a link to a Dow Corning article on the proper use of structural silicone. The above systems have been tested, both in a shock tube at Wilfred Baker Engineering, and in open air tests conducted by Applied Research Associates. The systems meet or exceed the standards required by the General Services Administration for blast mitigation. Mechanical systems are installed using some type of metal batten system similar to our Blastight Film Attachment System. The Blastight is secured with screws or other fasteners. Mechanical systems can be configured for various strengths in that they can be attached on one side, two sides, or on all fours sides. Top attachment (one-sided) is the method specified and used by the FBI. To keep the glass from being ejected out of the window frame and into the room, the film is overlapped onto the head of the window frame and mechanically attached with screws using a batten system. When the other three unattached sides of the glass fail, the film holds the glass together in one piece and the glass/film unit hinges up toward the ceiling and then falls back into place – similar to a “doggy door”. This system is designed to allow the glass to fail, which relieves blast pressures. As a result, the film itself does not see high pressures, and a minimum thickness fragment retention film generally is specified. This system should only be used with single pane glass. Two-sided attachments increase blast resistance to an existing window or glazing system. The film is overlapped onto two sides of the window frame – either top and bottom – or usually side to side. The two unattached sides will fail and the blast pressure will be vented. The attached sides are designed to hold the glass at the window opening. This system is very strong. Failure of this system is usually a result of the window frame itself giving way. Since the film receives a much higher load than either daylight or one-sided attachments, heavier gauge films are required. Four-sided attachments are the strongest of the mechanical attachment systems. The films are designed to withstand tremendous loads, and the full pressure of a blast event is transferred to the window framing. Most standard commercial windows or storefront systems cannot withstand this intense pressure and the window frame system will fail before the film attachment does. Four-sided attachments are often specified in day care facilities – areas where no glass particles can afford to penetrate – or as an inexpensive insurance policy against a large blast event. Since the film will experience severe pressure loads, heavier gauge films are required.